New Year – Presents, Grandfather Frost, and Fireworks! The most popular holiday of the year in Russia is the New Year! 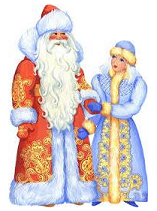 It’s the holiday which brings families together to eat a delicious meal, and the time of year that Russia’s Santa Claus, who is called Grandfather Frost (Ded Moroz), leaves presents under the New Year tree for children. Grandfather Frost doesn’t have reindeer, but instead travels on a troika (тройка) – a carriage pulled by three horses. He leaves his home town of Velikiy Ustyug in Russia’s Vologda Oblast and travels around with Snegourochka leaving presents for all the children! On December 31st, families gather together to wish each other a Happy New Year – S Novym Godom! (C Новым Годом!) A big meal is put together, with lots of different dishes, like a tasty potato salad called Olivye and sandwiches with red caviar. You can see a picture of the feast below. There is more information on Russian food on our Food and Drink page. Once the clock hits midnight, people head outside to set off fireworks. There are big displays in towns and cities, just like in the UK, and many people also set off their own fireworks outside their houses. Russian schoolchildren get lots of time off for the New Year holiday, a whole two weeks! 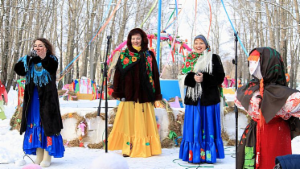 Maslenitsa (Масленица) is celebrated to mark the end of winter and the beginning of spring. One of its biggest traditions is making and eating lots and lots of delicious bliny (блины), which are big, round pancakes. They are eaten with lots of different fillings, like jam, honey, or sour cream, as well as some savoury fillings. There are several traditions associated with Easter (Пасха) in Russia. Instead of giving chocolate eggs, Russians take ordinary eggs and dye them lots of different colours, like in this picture, and give them as gifts to loved ones. People also give colourful decorated wooden eggs. Victory Day is a very popular holiday in Russia. It’s observed on 9 May and marks the end of the Great Patriotic War, which is how World War Two is known in Russia. Everybody has the day off school and work, and many people attend parades held in cities and towns and lay flowers at war memorial as a mark of respect for soldiers. Many war veterans also come to these events, and children often give them flowers. In the evening, there are concerts and big firework displays to celebrate the end of the war. Now that you’ve read about some of Russia’s holidays and festivals, which would you like to take part in? How do they compare to the holidays that you’re used to? New Year: 31 Dec С Новым Годом! Maslennitsa: Usually in February. It's like the Western Shrove Tuesday so the date changes each year depending on the date of the Russian Easter. С Масленницей! Easter: Usually in April. The date changes each year. NB the Russian Orthodox Easter is often on a different date to the Western Catholic / Protestant Easter. С Пасхой! Victory Day: 9 May С Днём Победы!